Some people have a costume party. Some people deck out their yards and houses. Others take the little ones trick-or-treating. For me, there’s no better way to celebrate Halloween than with a fun and frightful mystery and that’s just what Kathi Daley delivers in Halloween Hijinks. I’ve read another of Kathi’s Zoe Donovan mysteries, but really relished this opportunity to start the series from the beginning. For now, I’m on something of a dual track – reading the first and latest releases from this author that I love more and more with every reading experience. Going back to the beginning gave me the chance to see how everything started and I’m eager to carry on from here. 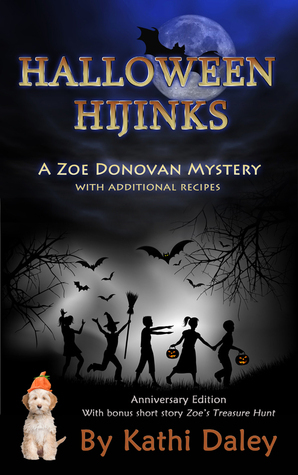 Halloween Hijinks introduces readers to Zoe Donovan, her family, her friends, and her charming hometown. The character canvas is full with not only humans, but plenty of pets, animals, and wildlife friends, as well! I so enjoy reading about all of the fun events that Zoe is involved in planning – as someone who does event planning for (a part of) her Day Job, it gives me new and fun ideas with every story. And I love Zoe’s heart for animals – if I could, I would have a sanctuary or shelter of my own to run. The only problem would be saying goodbye when the animals either found homes or went back into the wild! This story was a quick read that really got me into the Halloween holiday spirit.